Girls discus was first up. In the trials Kirsten Carter had that one huge throw to leave most of us in disbelief. Today Carters first round toss was 92′ 11″. 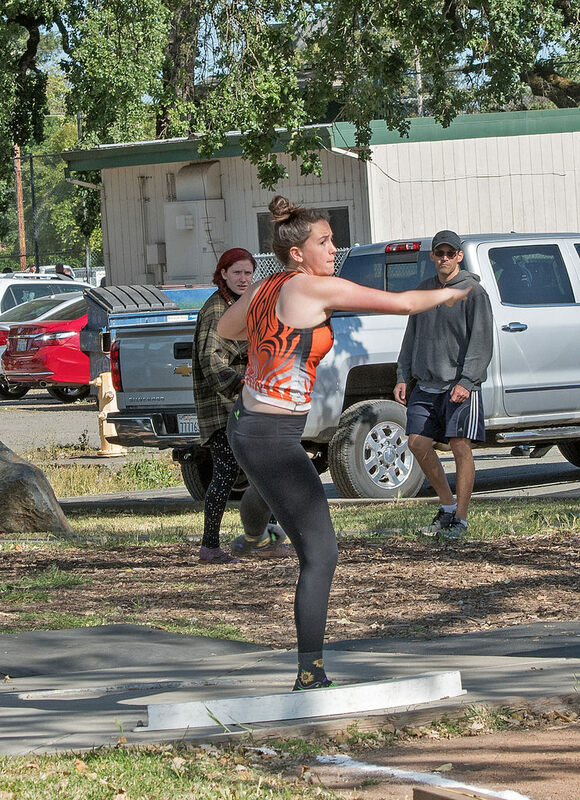 A decent throw for her and had her in second behind Lyla Swanton who went 93′ 2″. Alexia Onate fouled her first throw. Round 2 Carter fouled while Swanton destroyed her PR from the trials of 95′ 9″ sailing it out to 105′ 3″. Onate had a good 101′ 9″ to move into 2nd place. Kayley Walker went 94′ 3″ to bump Carter out of the top 3. Round three produced the winner for Onate as she grabbed first with 108′ 0″. Lilly McCoy went 92′ 10″ this round taking 5th which she would stay at but improve her mark to 93′ 7″ in the last round. Carter would have her best mark of the night in the fourth round with a 97′ 7″ for 3rd place. 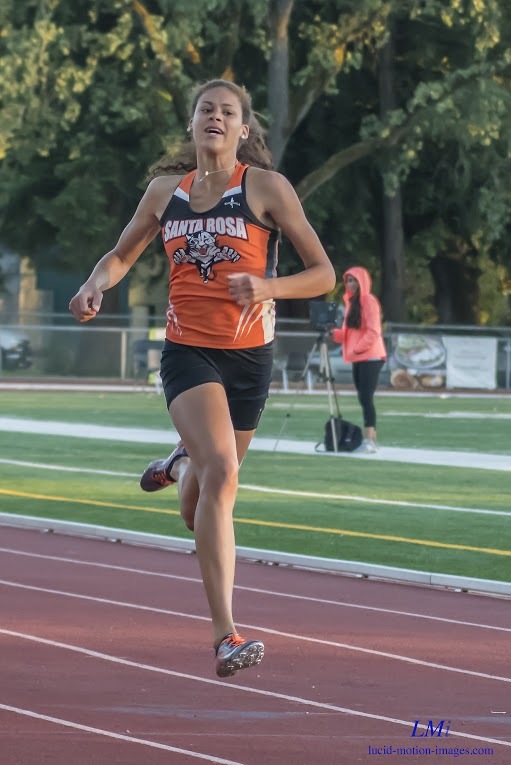 Jessica Villegas who was never worst than 6th earned the final spot to NCS next week with a best of 90′ 9″ in the 6th round. 7 Dunker, Shayla       Casa Grande            88' 8"
8 Germay, Sara         Montgomery             84' 4"
Less drama in the pole vault as the top four girls all had clean records over heights until they got to one they couldn’t get over. Bria Keelty and Sarah Kelleher each made 9′ 0″ with no misses to tie for third as Tiegan Carter had a miss at 8′ before her 9′ 0″ clearance. Savannah Nied was clean thru 9′ 6″ before not being able to clear 10′ 0″. Defending champion Audrey Stalcup cleared every height on her first try including the winner at 10′ 0″. 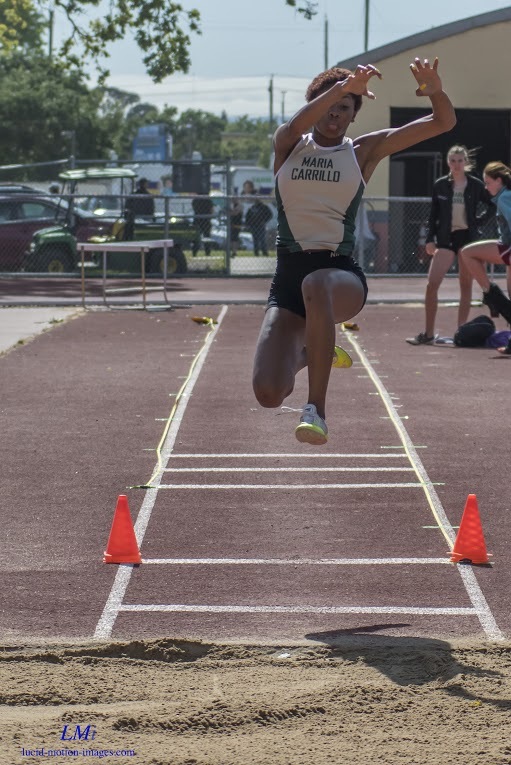 8 Souza, Charlene      Rancho Cotate           8' 0"
9 Krzyzek, Peyton      Santa Rosa              8' 0"
The top two spots in the long jump were determined after the first round as Amani Baker spanned 17′ 4″ and Sarah Aanenson went 16′ 5.75″. 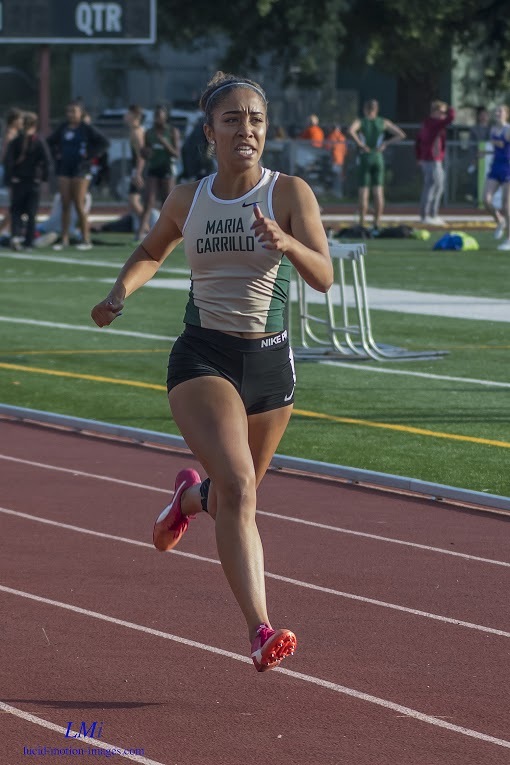 Perla Perez had a lifetime best of 15′ 10.50″ in the 5th round to earn third and drop Lauren Doran (15′ 6″) and Anna Hartmann (15′ 5″) to fourth and fifth. The shot put would also be determined in the first round for top three spots. Kirsten Carter opened with a big PR at 33′ 8″. 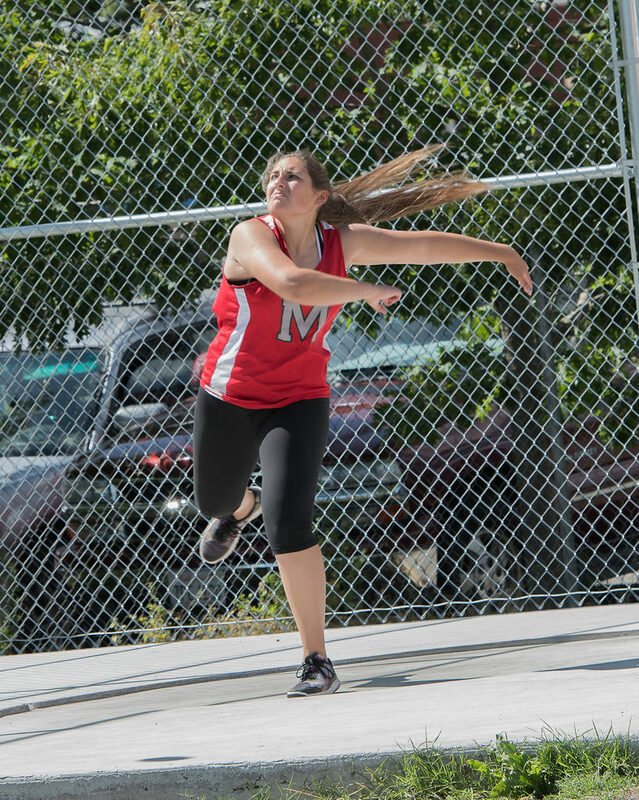 Annalea Hanakaewe then went 32′ 6″ before Caitlin Grace destroyed her PR with what would be the winner at 34′ 4″. Hanakaewe would improve to 33′ 6″ in the last round but stayed in third. 7 Schroth, Kendal      Santa Rosa             29' 9.5"
8 Swanton, Lyla        Cardinal Newman        28' 8"
Still more field events to go but now the track races are underway. 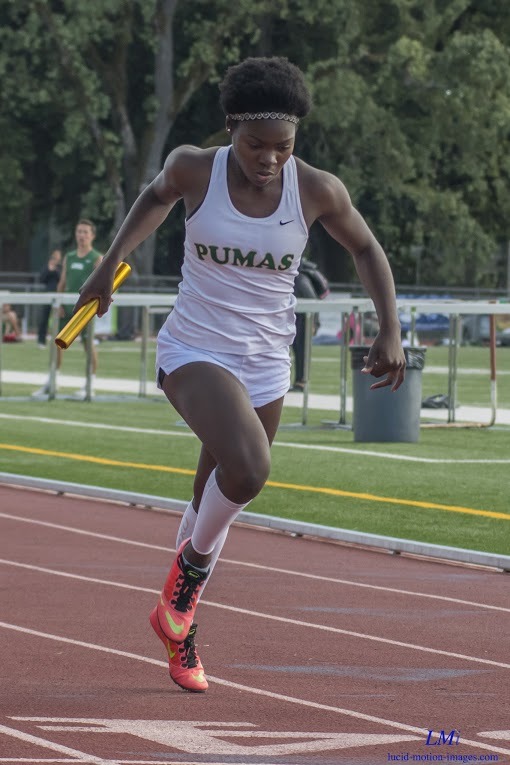 In the 400 relay Maria Carrillo (Amani Baker, Lucy Seagraves, Sarah Aanenso, Habibah Sanusi) as expected blew away the competition with a 50.12. Montgomery had a season best of 51.76 to take second ahead of Windsor 52.22 and Casa Grande 52.55. The 1600 also went as expected with Aimee Armstrong running away from the field by over ten seconds with a 5:14.32 win. Sydnie Rivas was second in 5:24.48 and Jasmine Becker in third with a PR 5:26.47. 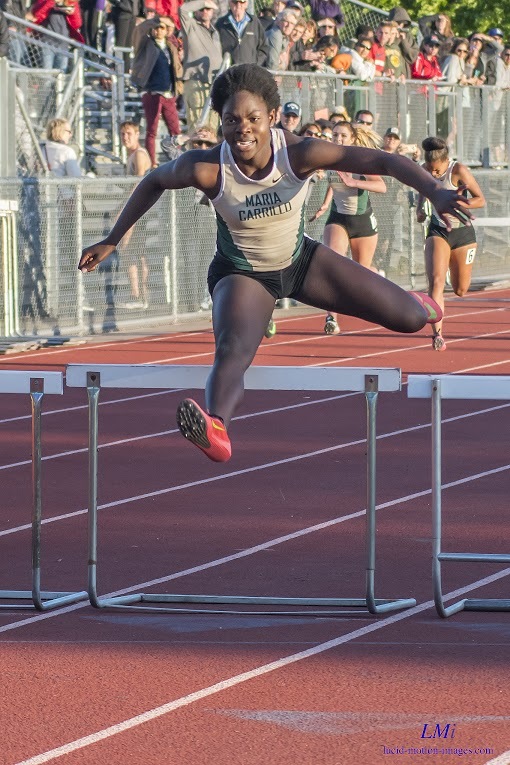 Habibah Sanusi has been the queen of the high hurdles this year but winning the league finals by over a full second is truly amazing. Sanusi won in 15.80 with Maddie Call (16.83), Lucy Segraves (16.97) and Dorah Brutus (17.04) battling for the next spots. Assata Polk was the class of the field in the 400 as she finished 1.7 seconds ahead of Kiely Rowe (61.08) and Grace Mackey (61.17) in 59.34. Margaret Smith had a season best of 62.28 for fourth. The 100 was as good as expected. Kirsten Carter running into a head wind still clocked 12.24 with Amani Baker also blazing at 12.41. Lauren Doran 12.91 would have won some of the past finals as would Habibah Sanusi fourth place finish in 13.02. Carter has now run 10 of top 19 100’s ever. Aimee Armstrong became the first girl of the night to win two individual titles as again, this time in the 800, destroying the field with her 2:20.57 PR. Talia Leano was the only girl within 10 seconds of her finishing in a season best 2:25.24. Jasmine Becker was next in 2:31.09 while Jayda Pignataro was fourth in 2:31.72. 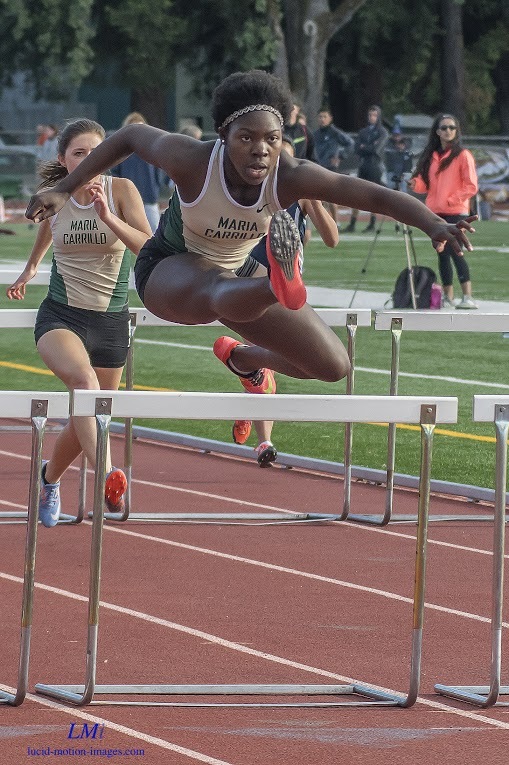 Habibah Sanusi is now the queen of the low hurdles breaking the prep best in the 300 low’s and moving all the way to 17th All-Time with a new school record 46.26. Well back but all breaking 50 seconds were Lucy Segraves (49.14), Maddie Call (49.59) and Oliva Nicholes (49.65). Kirsten Carter did more than just become the second girl of the night to win two individual titles with her 200 win in but took down the only meet record at 24.69 and again into a head wind. Carter now has the seven fastest 200’s ever. Amani Baker was a solid 2nd in 25.60. 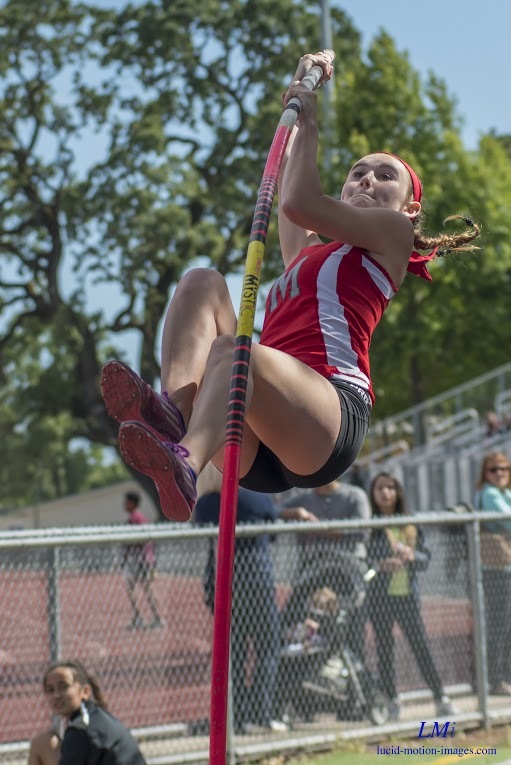 Back in the field events Isabelle Ponts was the clear winner in the high jump at 4-10 but after her there was a lot of drama as multiple jump-offs were needed to determine not only places but who would move on to NCS. Anna Hartmann and Iris Bica needed a jump-off after 4-8 marks with Hartmann taking 2nd place. Grace Alchemy took 4th at 4-8 with Evie Burke (5th), Ellie Pool (6th) and Kate Tembrock (7th) all needing to jump-off after 4-6 marks. 7J Tembrock, Katie      Windsor                 4' 6"
Classic battle in the triple jump as Emma Orosz who had taken over the NBL lead in the trials took on Anna Hartmann. Hartmann through down the gauntlet with an opening 34′ 1.75″ jump. Orosz fouled her first attempt. In the 2nd round Hartmann took the NBL seasonal lead away from Orosz with a 34′ 9″ PR. But Orosz responded this time with her own PR clearing 34′ 9.50″ and giving her what would end up being the 40th All-Time triple jump. Hartmann however would not be denied and produced a 34′ 11″ that would move her to =37th All-Time. 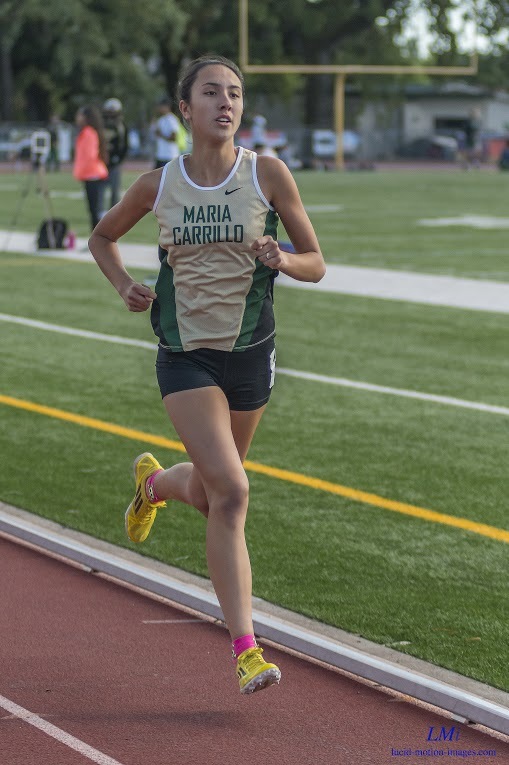 Sydnie Rivas ran a near PR in the 3200 (11:39.54) to put some distance between her and the only other runner capable of breaking 12 minutes tonight in Jasmine Becker (11:58.50). 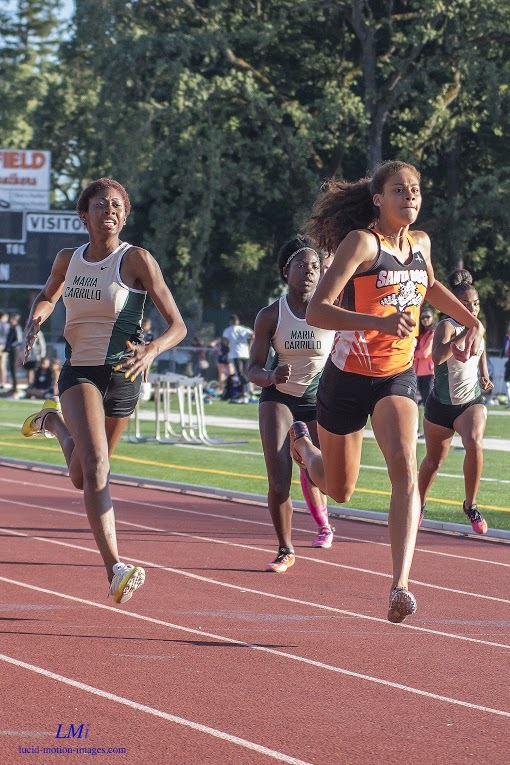 Maria Carrillo (Kiely Rowe, Talia Leno, Sarah Aanenson, Assata Polk) didn’t need it’s best effort to easily win the 1600 relay as their 4:06.79 was more than a second per runner faster than Montgomery’s season best of 4:13.48. Windsor was third in 4:22.41. 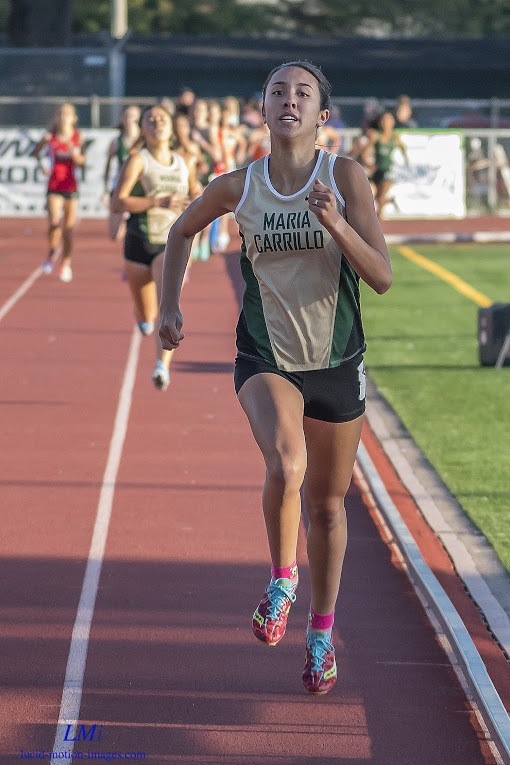 Maria Carrillo’s 195.5 team points were more than second place Montgomery (87) and third place Santa Rosa (80.5) combined. 4' 0"4' 2"4' 4"4' 6"
7 Helbig, Felicia      Maria Carrillo         20' 7"
8 Ramirez, Sandy       Santa Rosa             20' 5"
7 Abraha, Lily         Montgomery             70' 3"
8 Helbig, Felicia      Maria Carrillo         66' 4"